Erin Dilly is the hardest working mom on Broadway. The real-life mother of two is playing Mother in A Christmas Story, breaking hearts with her portrayal of a mom trying to cling on to every moment with her children. 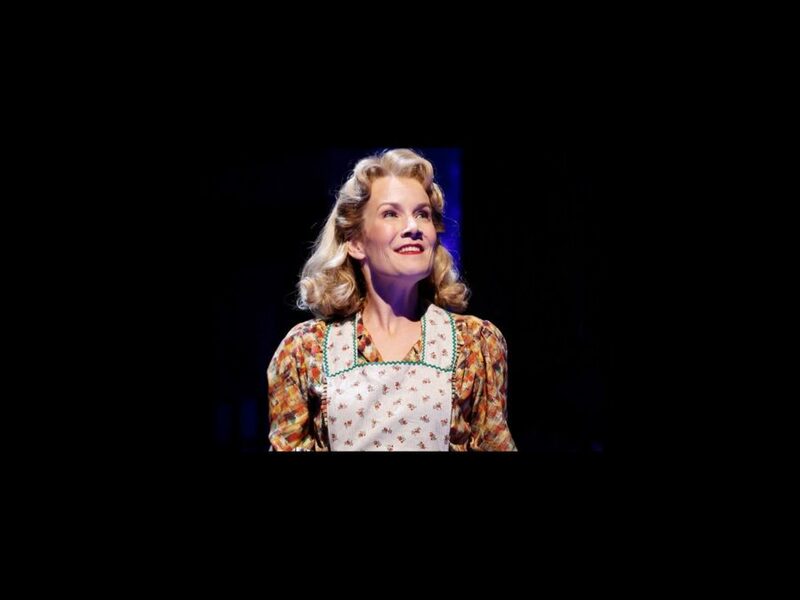 The veteran actress is well-versed in playing lovable leads, having brought to life Truly Scrumptious in Chitty Chitty Bang Bang (a Tony-nominated performance) and subbed for Kelli O'Hara as Billie Bendix in Nice Work If You Can Get It. Broadway.com chatted with Dilly and got the lowdown on obsessing over the movie version of A Christmas Story, how she's prepping for the holidays and what it's like to be a mom on Broadway. How much fun are you having in A Christmas Story? It’s ridiculous! The truth is, I have not been in a great number of hit Broadway shows, so it’s a wonderful gift to play a show to an audience that is both expectant and already appreciative from the first note. It’s so full of heart and so full of joy. With holiday shows, you're generally playing to audiences that are so happy to be there and so engaged in the spirit of the season. What was your experience with the movie? Do you have a tradition of watching it? I’ll put it to you this way: I got the call from my agent, and the first person I called was my big brother in Michigan, and he lost his mind. He and I and my sister are obsessed with this film. Every single Christmas, after the gifts have been opened, we sit in front of the television pretty much the entire day. It’s part of the underpinning of the Dilly family. You play the consummate mother in the show. With two little girls of your own, does it hit home for you? It does! I spend so much time at work mothering the little people in our show, literally doing on stage what I generally do at home, so I’ve had to pass over some of those duties to my wonderful husband [actor Stephen R. Buntrock]. But this show makes me miss my kids terribly, so I end up being a more engaged parent, because I know that I only get Monday afternoons with them. What makes this show such a special one? It’s about Christmas, but I think it transcends the season. It’s about family and connectivity and ultimately the relationship you have with the people you love. At the end of the day, it’s between Ralphie and his dad. Every single night, I have to shut my soul when Dan Lauria does that final speech and his voice breaks. It’s so beautifully written. Is it hard to be a Broadway mom? There’s just such a mutual support of what we’re trying to do, which is to support our family but also go home and continue our life’s work with our beautiful little people. A funny thing happens when you have babies: You don’t go away, but what you have to do in the world—just the reason that you do it—changes. Have your daughters expressed an interest in doing theater? [Six-year-old] Anna claims to have interest. I actually had to miss her performance of Honey, I Shrunk The Actors at the Essex Youth Theater in Montclair. I said to my husband, “Honey, how was she?” and he said, “Oh, she’s just terrible, but she thought she was great and she had a ball.” That’s all that matters to me! I have an instinct that she’s maybe going to be teaching. And Catie, my baby, I have no idea. She’s a wild card. She’s gonna be, like, a felon or the President. I hope it’s the latter. Let’s flash back eight years ago when you were nominated for a Tony Award for Chitty Chitty Bang Bang. What are your memories of the big night? I remember being hungry, because I forgot to eat. I remember sitting behind John Lithgow and his wife, and she gave me some nuts from her purse. I remember having such a good time, because I knew I wasn’t going to win; I just had to look pretty and not get nervous. That [year] was one of those beautiful seasons of killer performances, so I just felt honored to be amongst those cool women. You’ve done a ton of guest spots on TV and in movies. What stands out as a favorite? My favorite experience was what some people roll their eyes at the most, which was the Oscar-winning Lifetime movie Twelve Men of Christmas with my best friend Kristin Chenoweth. I played her sister, and it was like we had a party in Calgary. It was six days with my best friend, doing a cheesy Lifetime movie. That said, my absolute favorite film experience was Julie & Julia, which I got to do with the late Nora Ephron. It’s still surreal to me that she’s not with us. You, Kristin Chenoweth and Once's Anne L. Nathan are all best friends. How did you meet and why do you click? Kris and I met almost 15 years ago doing a regional production of Babes in Arms. She was sitting at the airport, and she looked at me and goes, “I know we’re gonna be best friends, but I just can’t talk right now,” because we’d been flying all day to get there. We fell madly in love. She literally is like my sister. And then I met Anne, and then Anne and Kristy met. I think the biggest thing between us, besides a humongous sense of humor, is a really long leash. We know that our lives are exceedingly different and we have so much crap going on that we count on being able to pick up where we left off with each other. And I don’t laugh with anyone like I laugh with the two of them. They always tease me because I’m the mushy-gushy one who will never say anything bad about anybody, and they’re the caustic, sarcastic ones who try to woo me to the dark side. We have to ask: What are your Christmas plans? I am ready for Christmas by virtue of the fact that I handed my husband the credit card and the computer and said, “Go!” My husband throws a big Christmas Eve dinner, and we sort of open the doors for all of our neighbors to come in and wish each other well. I luckily and thankfully have to do none of the cooking. I just walk around with the wine and smile and give people hugs. See Erin Dilly in A Christmas Story at Boston's Citi Wang Theatre from November 20 through December 8.